At First Choice Blinds, we have catered for many schools providing the solution to anti-glare and light elimination in classrooms. With the introduction of the new whiteboard systems in schools, it is becoming more and more frequent for schools to contact us looking for a solution for school blinds. Thankfully we have a large selection of fabrics and options available to cater for all types of windows and doors. We have worked with a long list of local national schools, secondary schools, private schools as well as locally funded schools. We are specialist in blackout roller blinds & screen blinds ideal for interactive whiteboards in schools. Our blinds comply with Department of Education specifications. Childsafe and fire retardant. Child safety is an increasing concern in student areas, particularly in primary schools and nurseries. First Choice Blinds lead in meeting this requirement with all our school blinds being fitted with chain and cord safety devices. We can also retro fit these safety devices to existing school blinds. 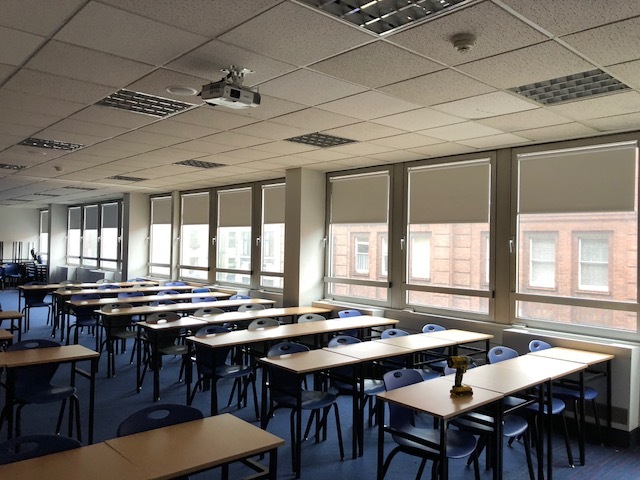 Budgetary constraints are ever increasing in the education sector and once again, whether you require school blinds or curtains, we are able to help with cost effective, competitive products suited to both your financial and shading needs.